Note: Mayon Volcano is currenly closed for climbing. 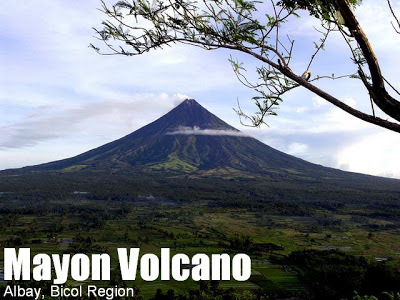 Mayon, magayon – Beautiful Mayon Volcano is one of the most spectacular mountains in the Philippines, and it is one of only two mountains in the world famous for a perfect conical shape, the other being Mt. Fuji in Japan. Its uninterrupted rise from the Bicol peninsula serves as the backdrop of the Cagsawa Ruins in one of most popular postcard scenes in the Philippines. Not surprisingly, the Cagsawa ruins themselves were caused by the volcano in its most devastating eruption in February 1814 which killed over a thousand. Indeed, just like Mt. Fuji, the symmetry and beauty of Mayon has ironically sprung forth from violent volcanic activity. In fact, Mayon is the most active volcano in the Philippines, with no less 46 volcanic eruptions occuring after 1814. Legends about Mt. Mayon inevitably arose throughout centuries, and the most famous is the central story in Bicolano mythology, that of Magayon, a princess whose famed beauty spread throughout the archipelago and was much-sought after by warriors and noblemen. It was a Tagalog warrior named Handiong who won her heart, and they became lovers. One version says their respective tribes were rivals and they had no choice but to commit suicide instead of letting go of each other. Another version says Handiong had a rival from another tribe, who was preferred by Magayon’s father — a clash ensued between the two suitors and . Regardless, the tales are in agreement that the lovers died side by side, and from their grave arose a volcano. They called it Magayon, a name which now means beautiful in the Bikolano language. 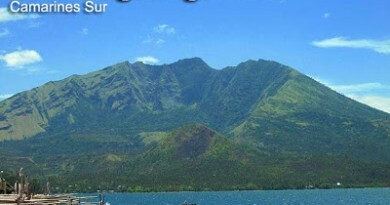 For indeed, Magayon the girl was beautiful, and now a volcano stands in her place as the crowning jewel of Bicolandia. The trek up Mayon is definitely an exciting adventure, made more challenging by the thrill and the knowledge that the volcano can erupt anytime. The trail starts off at 762m at the PHIVOLCS office in Tabaco, Albay. 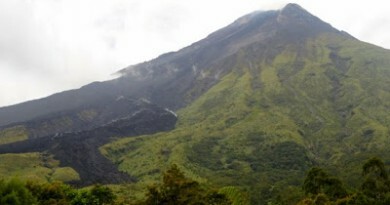 You will first enter a forest then reach a grassland of talahib; from there is what is known as Buang Gully- a ravine formed by an ancient lava flow. At the end of this gully is the first campsite, where one can spend lunchtime if aiming for Camp 2 by night in a summit climb, or you can spend the night there in the Day 1 of a trek to the Knife Edge. Beyond Camp 1, Camp 2 is two hours away, and from here the trek consists of rock scrambling and climbing until one reaches the Knife Edge. After the Knife Edge, the rock scrambing continues; the trail is understandably loose and steep. After 2 hours, the summit crater is reached. At the top, the view is vast and breathtaking; sights include Mt. 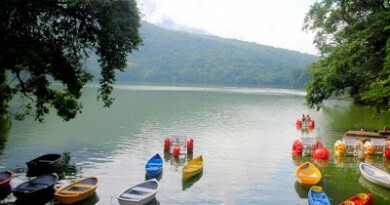 Isarog (NW); Bulusan Volcano (E) and the bodies of water that surround Bicolandia. Catanduanes, the large island, looms northeast. 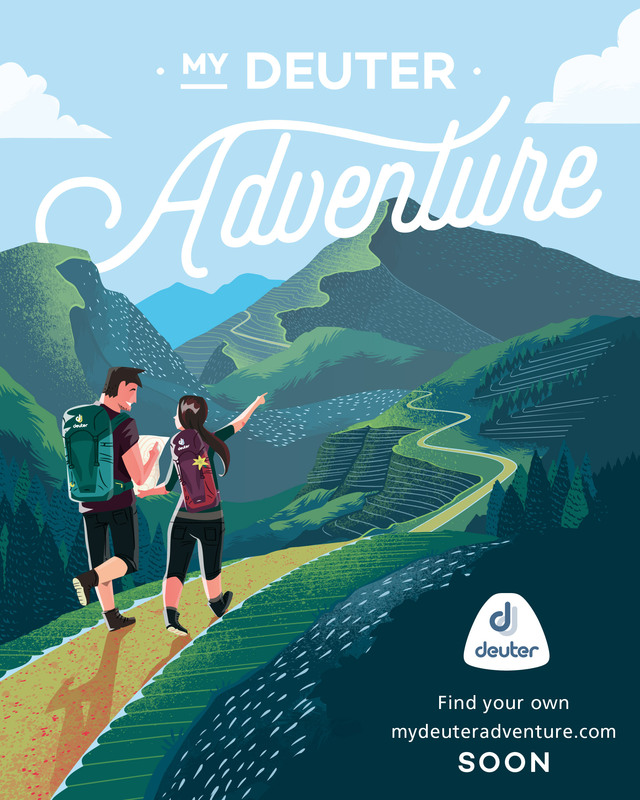 Whether the summit or the Knife Edge, the Mayo adventure is doubtless a memorable experience that we foresee will regain its status as one of the most sought-after climbing destinations in the Philippines. 1800 Back at jumpoff. Head back to Legazpi or other endpoints. 1200 Arrival at Camp 1, ~1500 MASL (end of Buang Gully?). Lunch. 0700 Start rock scrambing / scaling. Assault possible. 0900 ETA Knife Edge; 2200 MASL. Rest. 1300 Back at jumpoff. Head back to Legazpi or other endpoints. Summitability: Right now perhaps because of recent volcanic actvity, it may not be possible and it is currenly not permitted to climb all the way to the top. If feasible, then consult with local guides/contacts if ropes may be required. Some veteran climbers recommend the bringing of a gas mask to protect one’s self from the toxic fumes that emanate from the crater of Mayon. Other notes. The trail is very barren so prepare for sun protection. There is no reliable water source so a lot of water (4-5L) is suggested in the trek. Past eruptions of Mt. Mayon: 2004, 2003, 2002, 2001, 1993, 1984, 1978, 1968, 1947, 1943, 1941, 1939, 1938, 1928, 1902?, 1897, 1896, 1895, 1893, 1891-92, 1890, 1888, 1886-87, 1885, 1881-82, 1876, 1873, 1872, 1871-72, 1868, 1863?, 1862, 1861, 1860, 1859, 1858, 1857, 1855, 1853, 1851, 1846, 1845, 1839, 1834-35, 1827-28, 1814, 1811?, 1800, 1766, 1616. Henceforth “summitablity” will refer to the feasibility of reaching the summit of a particular mountain at the given (default is present) time. 45 Comments on "Mayon Volcano (2,462+) [CLOSED]"
m update na po ba sa mt. mayon kung kailan po pabubuksan ulit ang summit? mga sir magano po ang damage sa mt. mayon thanks!